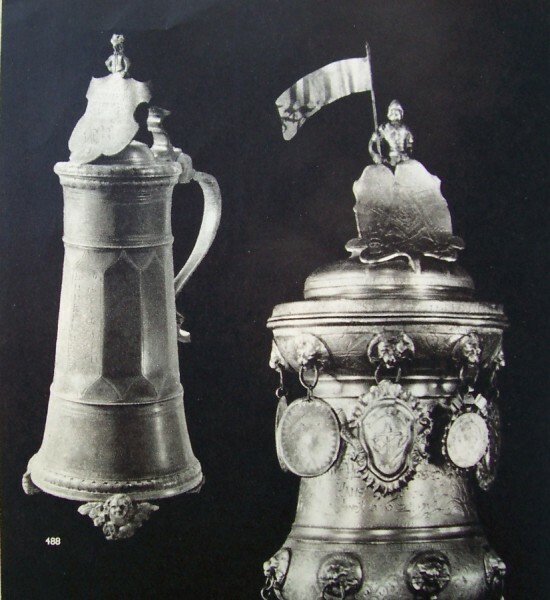 The introduction to this subject is from a Ron Fox article in “Prosit” explaining the benefits of attending any given ‘Beer Stein College,’ and it was then later reproduced in “The Pewter Collectors and Researchers’ Newsletter” with his permission. Best read at a higher magnification! 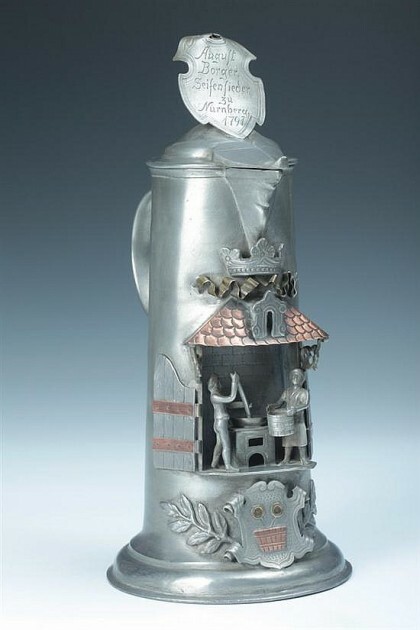 Called “Guild Steins” by SCI’ers and dealers, I believe these beer stein servers produced by the Family Weygang (and others) would be better called: “Pewter occupational servers” than “Guild steins”; which is a great mis-service to the real guild steins. 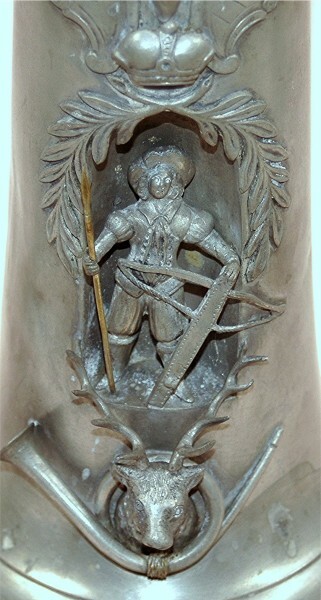 A couple of which are shown in the photos just above. 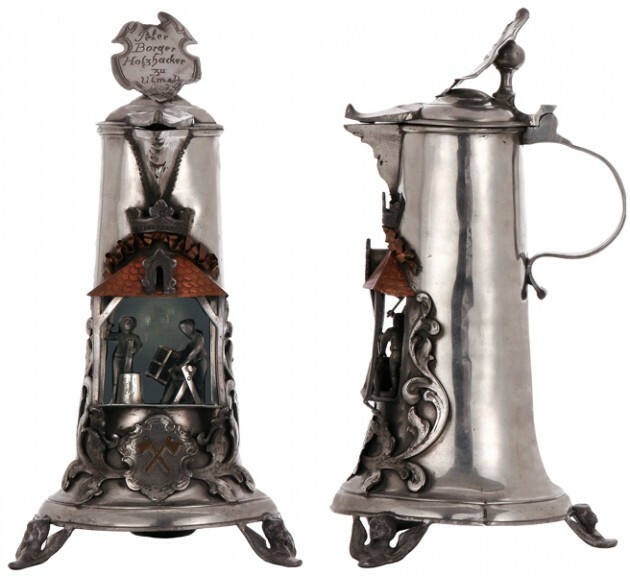 The stein “style” shown on the left in the second photo is probably the one the Weygang folks decided to us as a model; check out the angel feet. Above: A photo of a partial page in the book [ZNAV]. 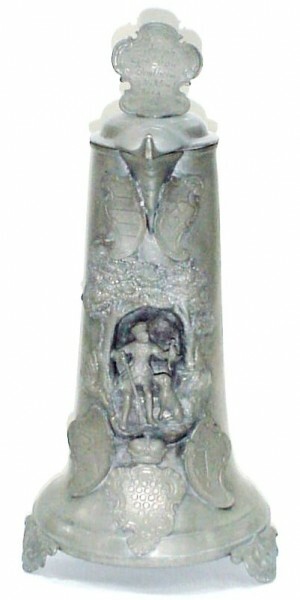 It shows how detailed the drawings of the items are. PIECES BELOW ARE NOT IN ALPHABETICAL ORDER! 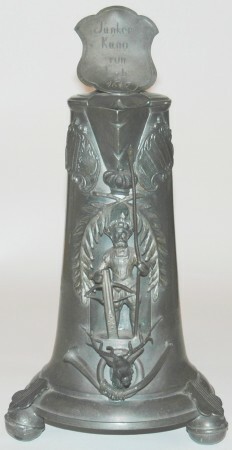 “KNIGHT WITH A SHIELD” – The most common “Niche stein” produced by Weygang. BELOW: There are any versions of basically the same server. 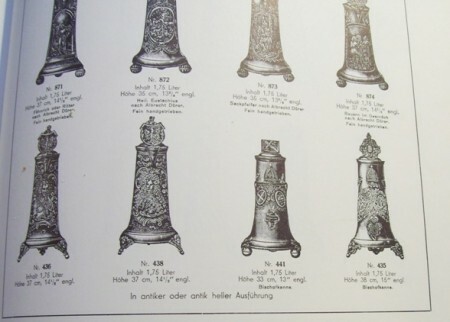 They were also produced in different sizes. 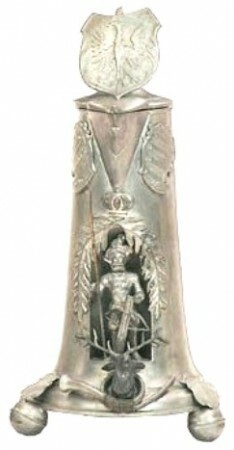 “Weygang”, by adding different finials, feet, coats of arms, and body side decorations, produced many versions of basically the same stein. 2 of the plainest, still nice to own. 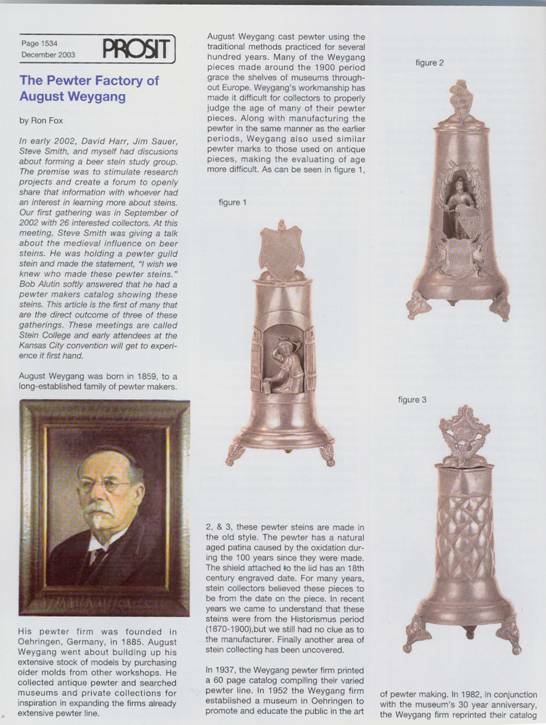 While most of these on this page are credited to being made by the Weygang family firm, Mr. Jerry Berg of the “Carolina Steiners” and a member of SCI, (and a super guy!) made a good point a few years back. 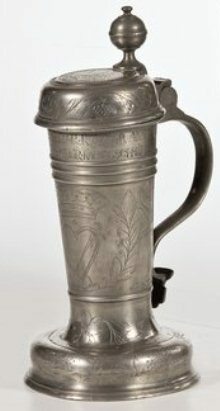 If these types were popular “way back then,” would not some other pewter firms / pewter-smiths jump on the wagon and produce these types of “Niche” tankards too? 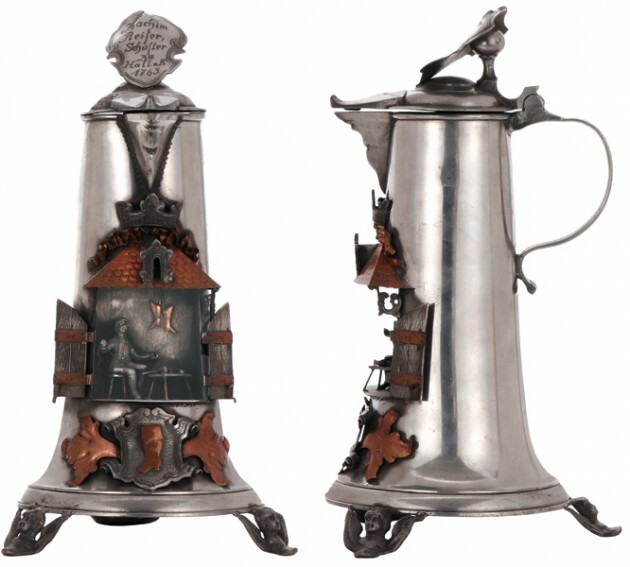 The two steins above I think well prove Jerry’s point. 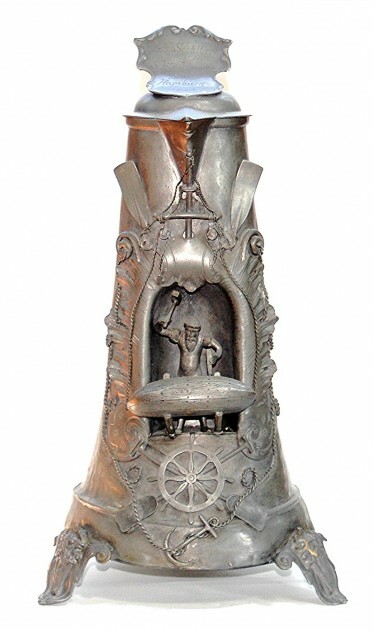 On the left, the face on the spout, and the dolphin feet are not usual Weygang traits. Neither is the way either shield is done, with the one on the lid is way too thick compared to others. 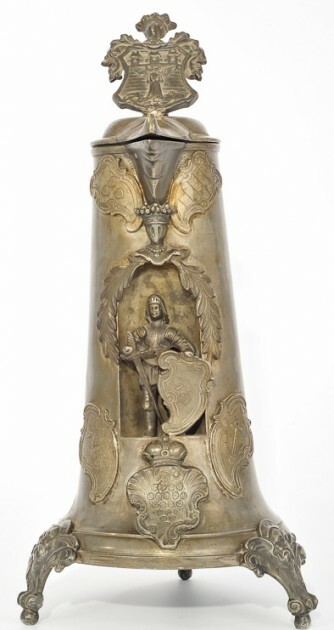 On the right, while not a “niche” stein, the shield looks close, but the crimped lid edge is never seen on Weygang’s. 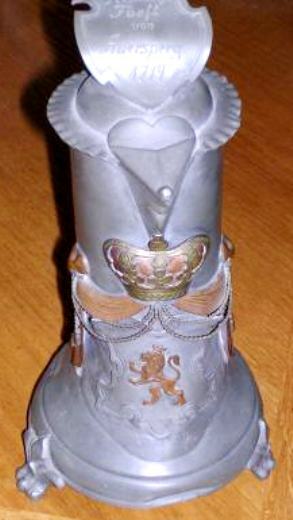 The feet again are different than seen; and also the way the Bohemian lion is portrayed with copper and plain mantling and the shield’s design is just too different. 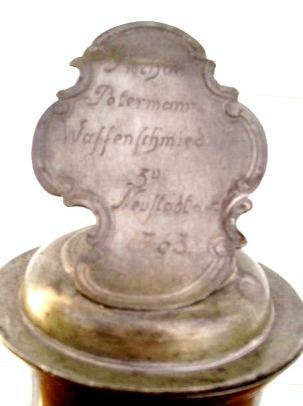 Now to confuse the issue even more = most but (I think) not all Weygang occupational servers are found with this “rosette” on the bottom of the stein. 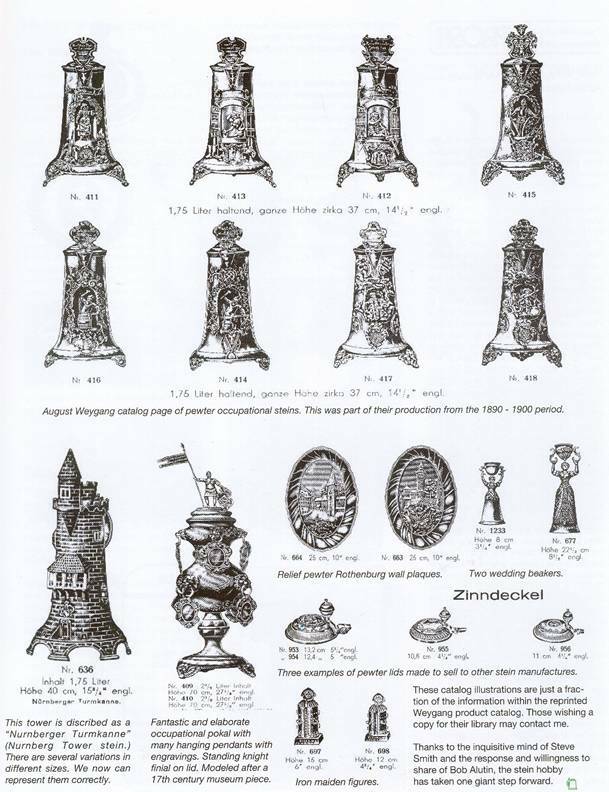 Nobody, including me, knows if they keep the same rosette design over all the years they produced these wares. Something to do when I have more time! Ha!! [L] Comes with the Nuremberg Harpie as the bottom shield and another city’s arms on the lid! 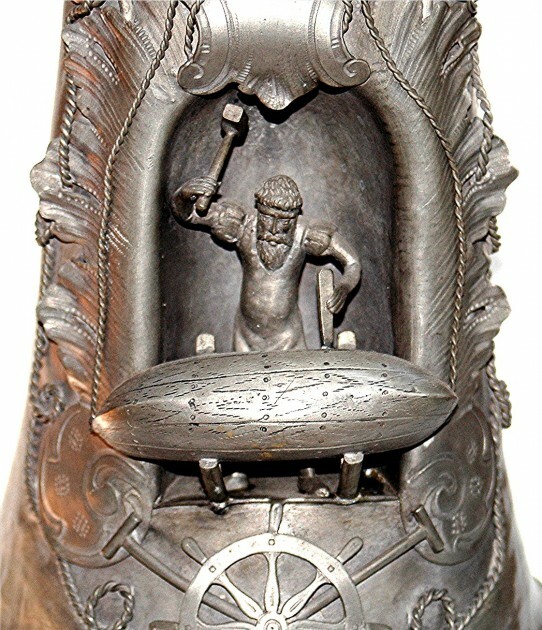 [R] Someone, later in it’s life, added this ball thumblift to the lid as a finial. 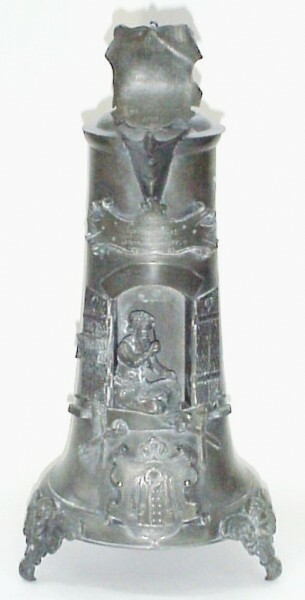 Knight with sword in the niche, and with a standard bearer as a finial. A nice combo. 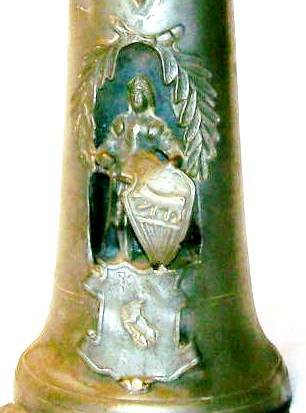 Six shields on this one’s body! 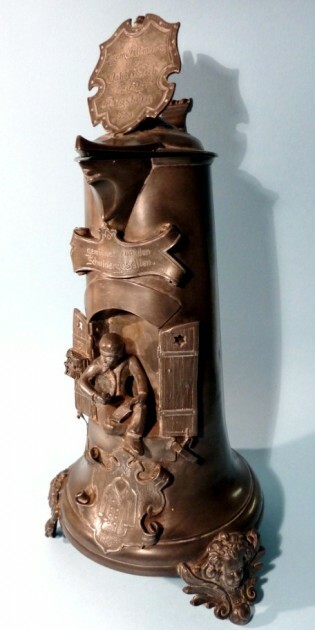 Above: One of the best version of the “Knight and shield” with reliefs of the wall towers of the City of Nuremberg. The example on the right, while a larger size, and having been cleaned, with steps and more bricks in the wall, has lost its shield! 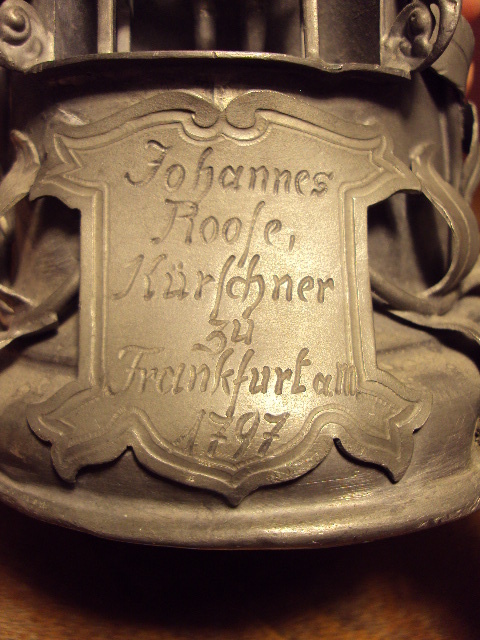 On the lid’s shield: “Johann Friederich Burgraff von Nurnberg – 1610.” The shields put on these steins vary. 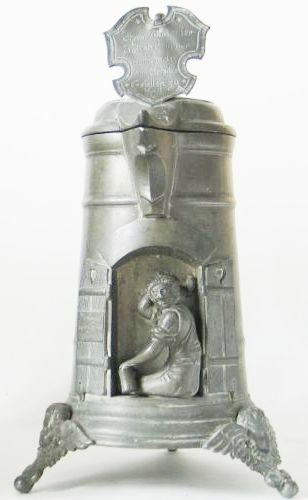 [L] The same stein as just above – please compare with another version (on right) with completely different brick work above the knight, and the design of the platform below him. 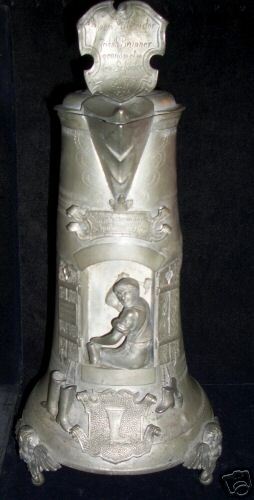 The one on the right has a date on the keystone. [L] Both bow and lance. 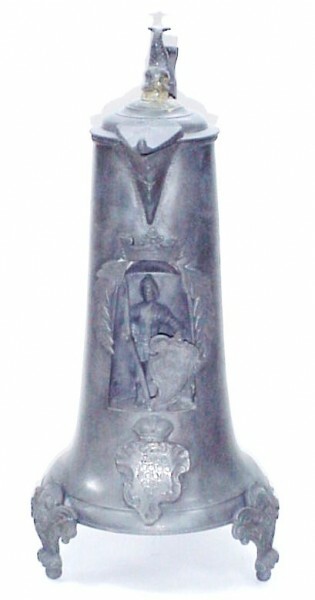 [R] Weapons are reversed and a different shield on the lid. 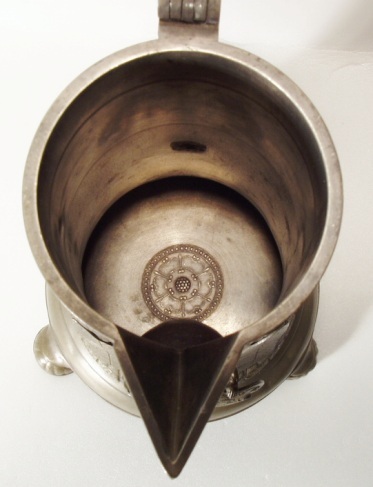 At first glance it appeases these are close to being identical, but on the right one there is a different spout, base rim and coat of arms. 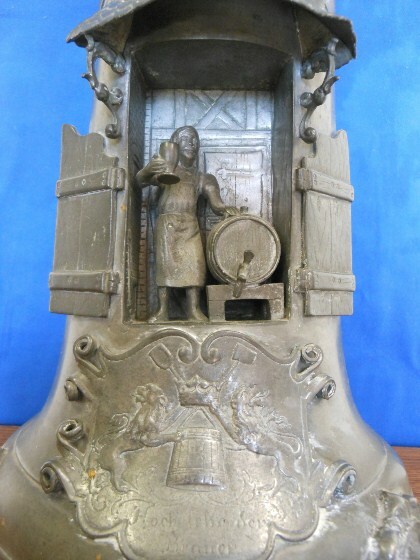 CALLED A SOAP MAKER – BY THE USA AUCTION HOUSE, BUT I’M NOT CERTAIN THAT’S CORRECT. [L] Neat copper awning, horse shoe and ball feet. [R] A single black-smith. Two blacksmiths. 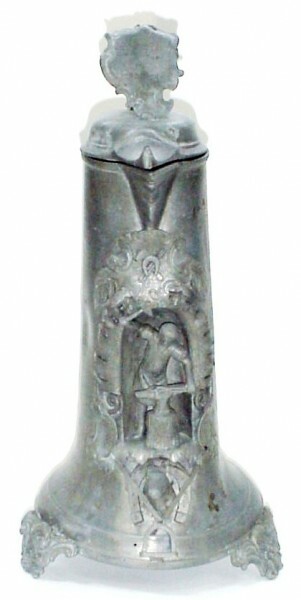 Probably an early version, say 1870’s . 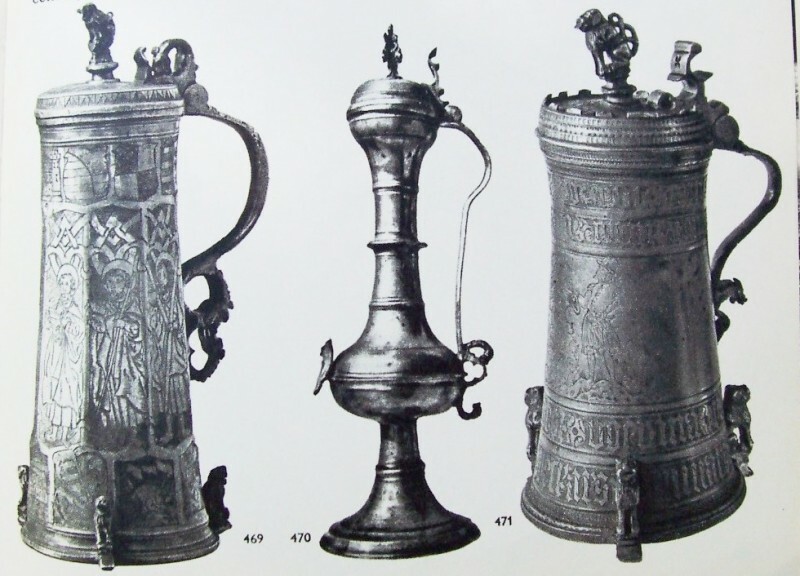 These bulbous steins are harder to find. 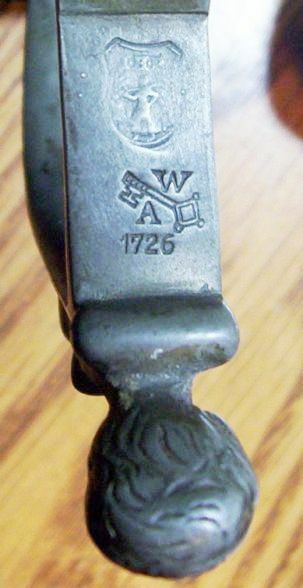 [L] Key and lock maker (a blacksmith) [R] Another key maker, an “occupational server,” but it has almost no niche. [L]- A smaller and less busy version. This very scarce Weygang type server that was seen in a museum in Winchester Va., in 2010. 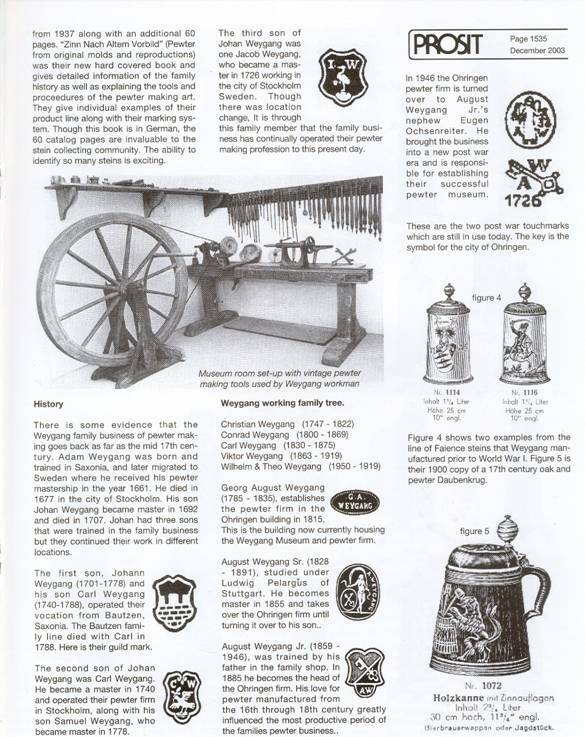 All this BELOW really doesn’t fit with any category I have developed for Family Weygang beer stein info. 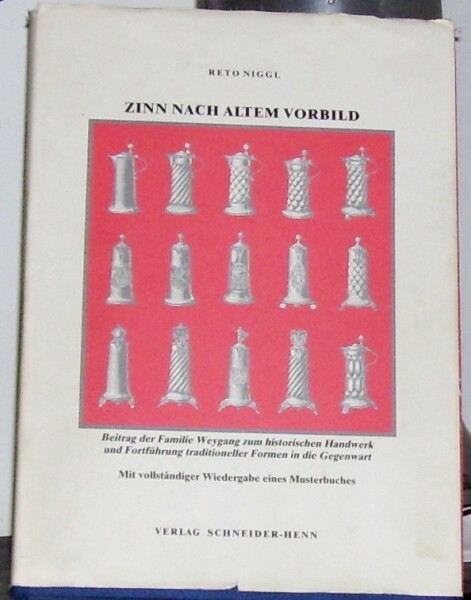 But this is a Weygang Roerken that was not shown in the book “ZINN NACH ALTEM VORBILD” [ZNAV.] 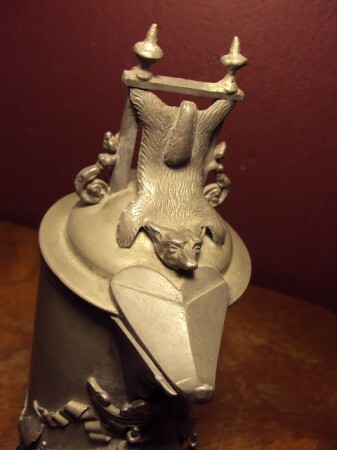 It is however very interesting to me, and perhaps the other pewter guys out there, so I just stuck it here at the end of page one. I do hope it makes sense. 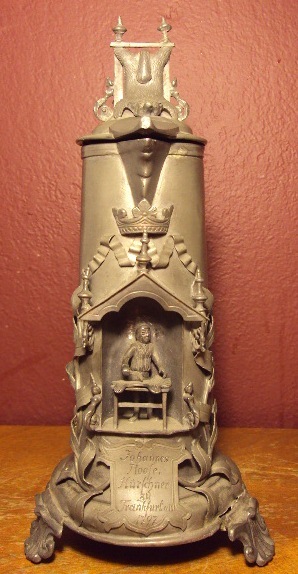 PLUS SHIPPING FROM GERMANY = A MINIMUM OF $25.00 (FOR A MEDIUM SIZED PEWTER STEIN) [+] $254.52, SO TOTAL = $279.52! ROUNDED TO $300.00!…. FROM $202.